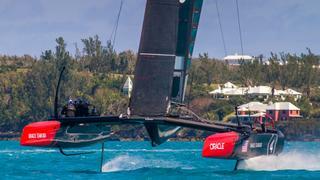 Oracle Team USA capsized its AC45S test boat during training in Bermuda on Wednesday afternoon (March 2). Oracle Team USA is the second America's Cup team to capsize during testing, following Land Rover BAR’s capsize on the Solent in the UK in December. Although, last year, two members of Oracle Team USA had a dramatic crash in a smaller Flying Phantom training boat. “It was a great day for training, sunny, 15-20 knots of wind,” said Oracle Team USA skipper Jimmy Spithill. “So it was a great afternoon of sailing until we capsized. The team was able to right the boat and return to base with minimal damage. All the crewmembers are safe and the team will hope to waste no time in getting back out training. The six teams have gone straight back to their training bases following the recent Louis Vuitton America’s Cup World Series in Oman, which was won by Land Rover BAR in a tight finish. 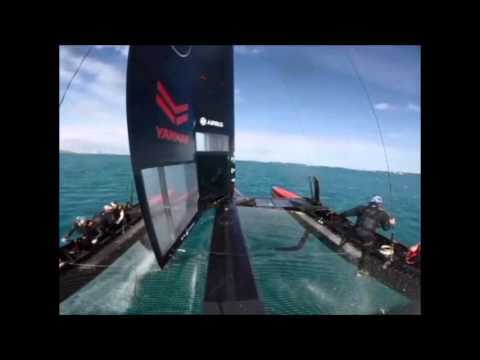 For the World Series events all of the teams are using the same AC45 foiling catamarans. The next World Series event takes place in New York in May, before the teams travel to the “Windy City” of Chicago in June. Between World Series events the teams are using test boats to aid with development of the race boats that will be used in the 35th America’s Cup in Bermuda in 2017. No stone is being left unturned in the race to build the fastest boat. For example, Land Rover BAR has brought on experts from the world of Formula One, has teamed up with Land Rover’s technical team and is even using 3D printing to build components for its high-tech race boat.